Zingale are an obscure band to prog heads around the world, but in it's native country israel, the band was regarded as innovative and groundbreaking, trying to bring progressive rock music from the west to the conservative israel. A lot of artists before them played with the idea of progressive music, but always fused it with pop elements and were trying to get it through by adjusting it to the timid and tamed audience. Zingale were innovative beacause they released an album that was not trying to please the audience nor the record company, the album is 100% progressive rock full of ideas, taking his influences from bands like Yes and Gentle Giant. Out there in the big world Zingale didn't stand a chance, music was progressing faster and to other areas, never explored before, top that with better recording studios, technology and engineers with years of experience producing complex and experimental music, and you have a fine project that was doomed to fail. Being overshadowed by the big names in prog, doesn't mean their only take on progressive rock was not good, infact it was excellent. The main problem with the album ( and maybe the only one ) is the average recording quality and the amateurish horrible mixing, said to have been done by another person who didn't know the project or his goals. That surely affected the album's level, how to get all those instruments in to one track, and make it sound good, something that was never done in israel before. 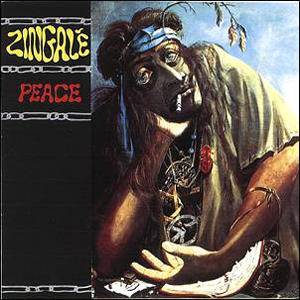 Zingale was not all about the music, it was about the idea of the band members about world peace, written in words and expressed with music, hence the album's one word title 'Peace'. Lyrics was written to express the trauma of the 1973 war, those musicians faught just a year before, and try to plant the idea of world piece, and what a better idea to do it with progressive rock which represents freedom, fusion and new ideas. But enough with the babbling, what's the music like? Zingale are tagged as fusion but that's only one side of the band, the music is more constructed, even the instrumental parts which seems to follow a clear line. The music is symphonic, jazzy, rocky, eclectic and above all beautiful. Being a concept album, the songs are divided to instrumental parts which lies on the intricate interplay between all members, and songs which demonstrates the good writing quality of band, and their ability of writing actual songs. The band are using a lot of instruments together besides your standard rock group instruments, like harmonica, violin, synths, piano and tablas. Musicians are simply outstanding and you have a real feel of togethrness and unity, they play with a lot passion and sensitivity which is most evident in the instrumental parts. Bass by Udi Tamir is gigantic, trying to bring the Chris Squire sound, and is definitely doing a great job. Keys are wonderful throughout, using a lot of fender rhodes and is pretty diverse in it's playing. The band is not trying to produce a 'Close To The Edge' sequel nor to have ELP like runs on the keys, the album's value lies on the exceptional beautiful writing, memorable lines, and high energies delivered by the band's playing. 'Heroica' and 'Carinal' are two great instrumentals that sounds like a big party, happy, enjoyable and so fun to listen to. They are based on the fast interplay by all members featuring very good violin work, strong bass occasionally with wah wah, excellent keys and masterful drumming. 'Love Song' is one of the strongest tracks on the album, featuring a beautiful ballad working under cover in a progy song, beautiful guitar solo and some good vocals too. '7 Flowers Street' is 3 minutes of sheer beauty, carried out with acoustic guitar and excellent violin by Tony Brower, who continues to shine for the entire album, and must be regarded as the band's secret weapon. Part 2 of this reissue including 6 songs that was meant for their second album. it sees the band aiming lower towards more acceptable anthems, and less adventuroues songs, singing in hebrew instead of english. Gone is the masterful violin dominating the original LP, and keys are also absent leaving the album with a more simpler sound. But being a good band to begin with, the playing is still good, and some progressive elements are still there, the songs are not bad just simpler and i'm sure they won't appeal to anyone who wasn't excited by the album. Let's get things in perspective, I can not compare this work with other phenomenal, groundbreaking albums coming out that year, receiving a 5 star rating by most reviewers, but this release hits me in a deep place and even the terrible sound does not prevent me of giving it a good listen once in a long while. Like i said it is not a masterpiece and i can understand reviewers giving it a 3 star, but some just may enjoy this as much as i do. So i feel a 5 star is appropriate to settle my enthusiasm.